It took over 6 long years before I could think of travelling to this wonderland on earth. Though I could not still visit the place the way I wanted i.e. by road, as they say, something is better than nothing. The first thing that came to my mind while thinking of travelling to the land of high passes was to experience the magic. The magic of nature. I wanted to truly experience the mountains, get lost in their glory and came out as a different person. No other place where I travelled in the past could give me that thrill. I read this many times that visiting mountains gives a person a different perspective on life. I read that someone travelling to mountains comes back as a different person. I thought it is more of exaggeration. But I thought wrong. My all doubts, questions, uncertainties, anguish, frustrations, stress and whatnot disappeared as soon as I landed in Leh. I realised there's more to life than what we do in plains to earn a living. I realised how far we are from nature and how far we are from ourselves. 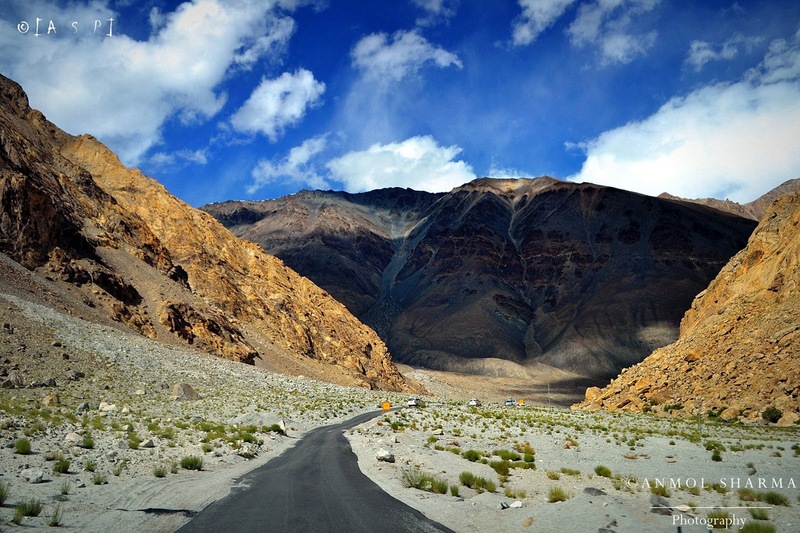 Planning for a trip to Leh Ladakh is not an easy task. Though you can travel solo to this place, I thought why not to do it with people you are most comfortable with. Your friends! But making everyone agree to visit Leh again is not as easy as it just seems to be. You never know if your friends feel the same way for Ladakh as you do. You don't know if they could make themselves available and commit to those dates considering everyone's busy corporate life. The first plan to visit Leh came to my mind in December 2016 where I asked my friends to travel to Leh with me in April 2017. But a couple of those wanted to switch jobs, serving notice periods and other commitments. So the plan was called off. I again initiated in March and asked if they seriously want to travel to Ladakh as I want to else I would be doing it solo. After a meeting, it was finalized that we were visiting Leh in September 2017 with everyone informing in their offices 3-4 months prior to the trip to avoid any last minute surprises. I wanted to travel in the car with my friend's plan to buy an S-Cross in August but with less time in hands and considering practicality, we booked our flights in the month of April 2017 for dates 8th-13th September. We booked our hotels in the month of June and we were all set for this trip. The wait was getting longer with various apprehensions (especially in terms of acclimatization)coming to mind on the success of the trip. However beating all the odds, our Go-Air flight was ready to take off from Delhi airport for Leh on the early morning of 8th September. We were 5 travelers. Our Day 1 started early at 4 am. With all bags packed up, I was all set to start for the airport from home. The excitement was so much that I could barely sleep the previous night. The enthusiasm was so much that I somewhere knew I was breaking the inner shackles and moving to a place that has so much to offer. I along with my friend near to my place reached Delhi airport sharp at 5 am. The other three joined rather the same time. With acclimatisation in my mind, I was preparing my self mentally and a night before leaving started taking a diet rich in carbs. I kept few packs of Glucose to deal with low energy levels in case of low oxygen affecting me in any way. Glucose drink helped me a lot. Except for a minor headache, I didn't face any issue. Our flight was scheduled to take off at 6 am. 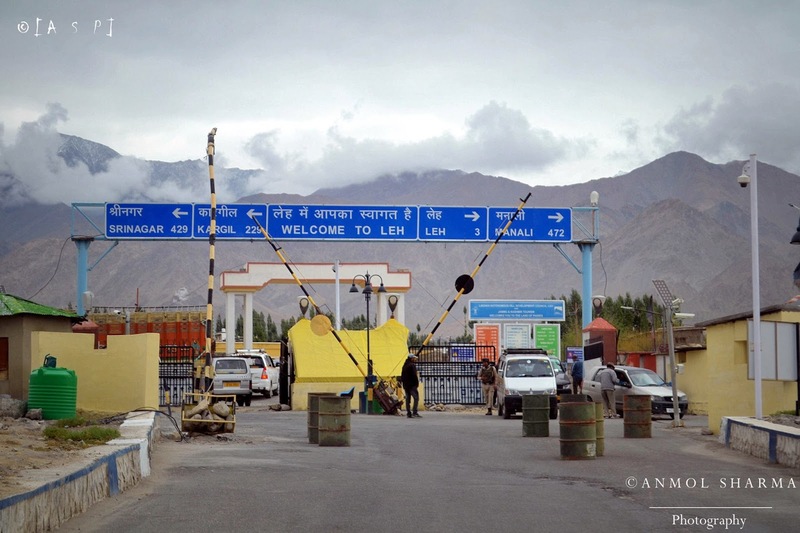 We were outside Leh airport sharp 8.30 am after collecting our baggage. The difference in temperature was quite significant. With over 35 Degrees of Delhi temperature, we were in cold weather conditions in about 120 minutes with temperature in 8-9 Degrees range. As soon as we landed in Leh, we called out Hotel and asked them to send a car to pick us. The driver arrived within 15 minutes and we reached the hotel. After checking in, we consulted hotel owner regarding our plan for Day 1. The gentleman advised us to take rest for few hours and asked us to decide only by late afternoon on whether to go for sightseeing as per our plan. He advised not to have eggs for breakfast or have a non-veg meal on day 1 itself. After breakfast, we went to our rooms and slept for few hours. Around 2 PM, I checked with all my friends for any problems related to acclimatisation. All were fine with no complaints. We decided to explore following places on Day 1 itself considering our short period of the trip. As per our plan, we were happy that we could cover all of the above places and reach back our hotel by late evening. 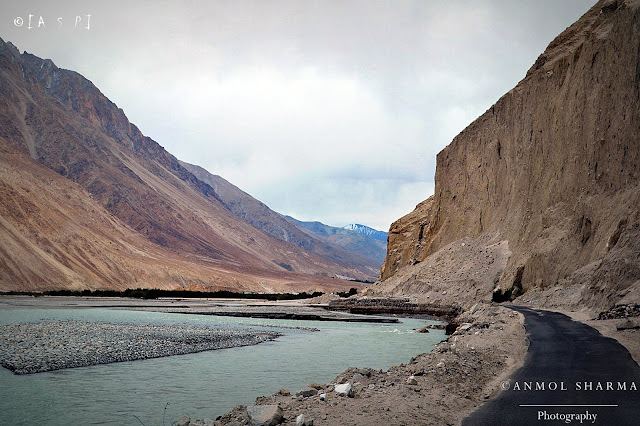 We first reached Sangam - The Zanskar & Indus Converging Point. A place where Indus and Zanskar rivers meet at a point. 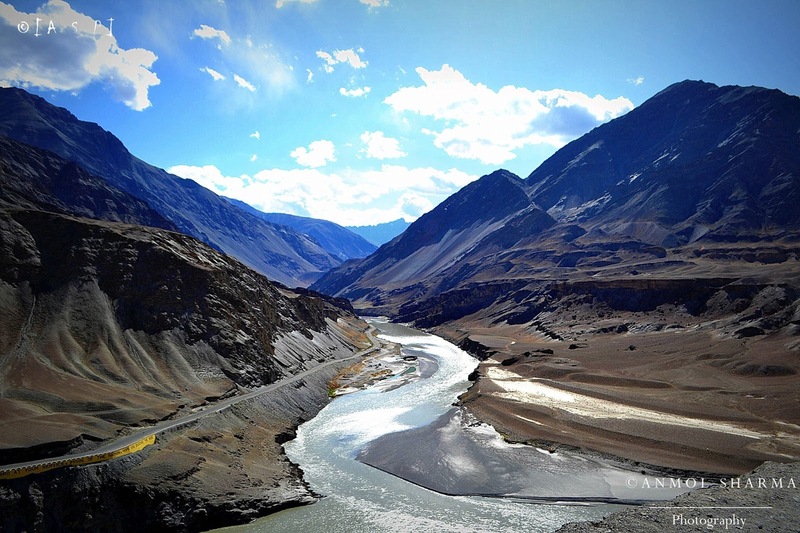 Both rivers have a different colour, with Indus being green and Zanskar a bit brownish. That was one spectacular sight. We wanted to do river rafting but that itself would have consumed the entire day and we would have to skip other places, so after spending some time there, we came back. The highway is beautiful, a dream road to ride and drive. The tarmac was as smooth as butter. Our next stop was the Magnetic Hill. There is a spot where you could do ATV ride around the hill. It was a new experience for us and we rode ATV for around 30 minutes. My friend later told me that the ATV track at Hunder is much better than this but considering our schedule we did it at Magnetic hill track. After experiencing defiance of gravity at Magnetic Hill, we reached Gurudwara Patthar Saheb. This Gurudwara is located 12000 ft above sea level and was built in the memory of Guru Nanak Dev Ji to commemorate the visit to the Ladakh region of Guru Nanak Dev. A wonderful experience there. I always love to spend time in any Gurudwara here in Delhi as well and Patthar Saheb was one amazing visit. we had langar chai & boondi prashad and started back for our hotel - Hotel Layul Palace. Day 1 ended by 9pm after having dinner, we watched TV, played games and had fun. On Day 2 after finishing our breakfast, we sent a person from hotel to get permits issued for us from the DC office. 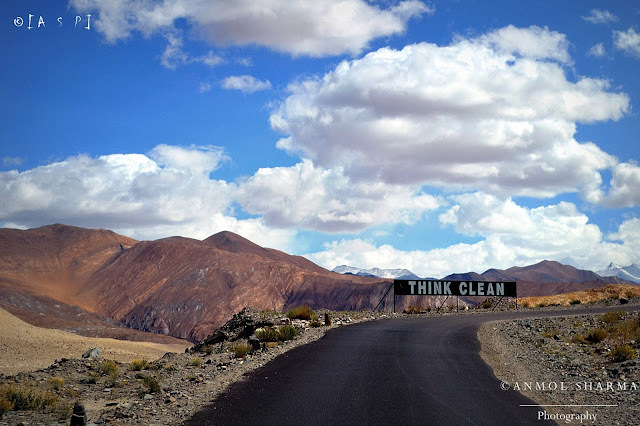 Within an hour, we had permits to visit further places in Ladakh. The process of getting permits issued from DC office is even easier if you get it done with help from a representative of the hotel you are staying with. There were 3 copies of the permit. 2 were provided at checkpoints and one was travelers copy. We head to the Leh city market and looking for shops renting out oxygen cylinders. We arranged for an oxygen cylinder as we had to approach even higher altitudes. The oxygen cylinders come in two varieties - the conventional cylinder which is rented out for Rs. 2000 which is not refundable no matter if you use the cylinder or not. The other type is a spray & use cans which can be purchased and taken along with you. Now since we were not sure which one would be better, we opted for a conventional cylinder. One of our friends had a headache since the night, she had a bit issues with altitude including a headache. So before heading further, we took her to a local clinic and got her oxygen levels tested along with ours as well. The levels were perfectly fine and we decided to start further. 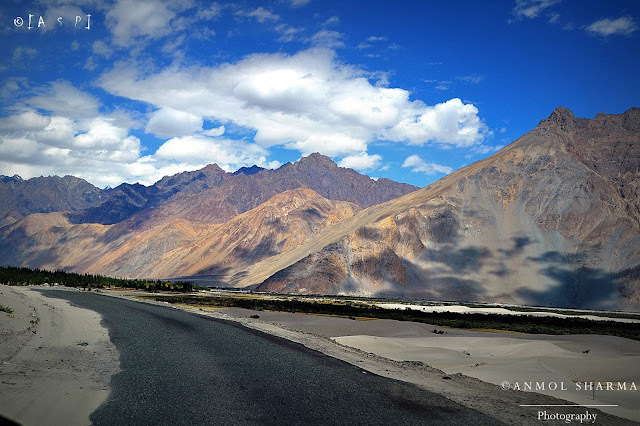 We had plans to reach Nubra Valley after visiting Khardung La top but we discovered that there is a half marathon scheduled for 9th September in Leh Ladakh and some routes will be closed which means we have to skip KhardungLa for today and alter our route to reach Nubra Valley. 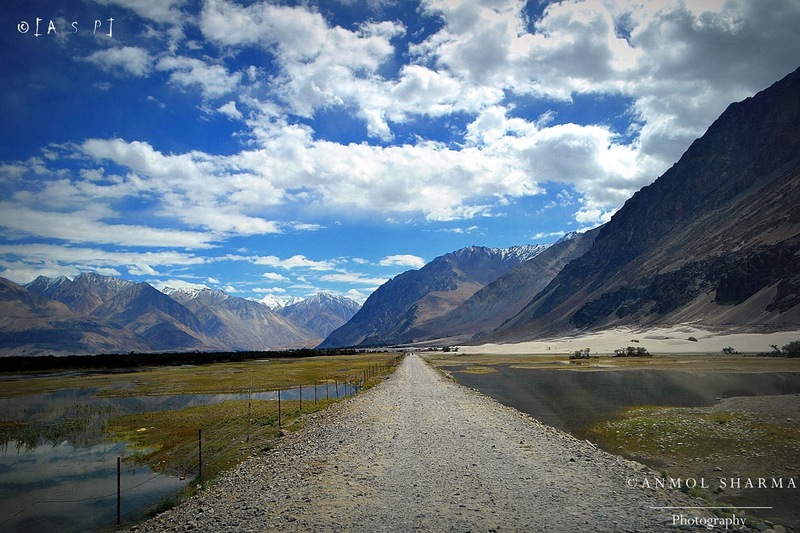 The other not so famous route to Nubra valley is via shyok river. This route does not have many travelers. Some roads in the route are in bad conditions and increase your travel time up to 2-3 hours. We started for Nubra valley around 11 am in the morning from Leh city and reached Nubra valley around 5 pm. 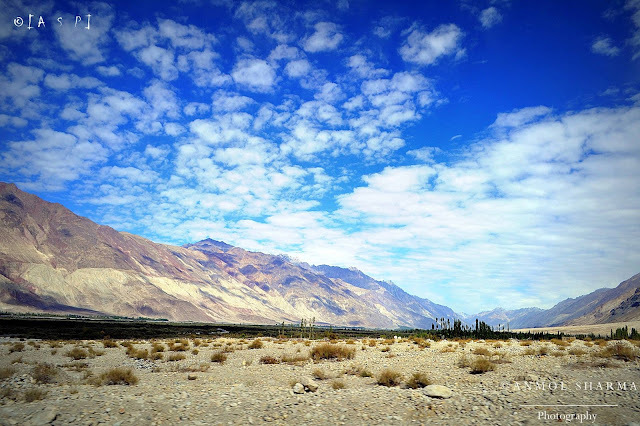 We checked in with our homestay - Kailash Mansarovar, Nubra Valley. Since we reached quite late, there were not many options for sightseeing. After taking tea rest, we visited Panamic hot springs in the evening. We could reach there just before sunset. The Panamic hot springs was an interesting place situated in a beautiful location. The spring has high sulfur content and it is a first natural geyser I ever experienced. Considering the chill at that time of the evening, the water flowing down the rocks was definitely warm if not hot. There are a couple of bathrooms out there too if one wants to have a shower. I didn't know that Nubra Valley doesn't get 24*7 power supply and light comes through government generator which is turned off at 11 PM in the night. We would have then stayed at Hunder which receives electricity and is better crowded. We stayed at our homestay without electricity and there were no other guests as well in that homestay. Quite an experience it was - both thrilling and spooky at times as well. We used our phone's LED light for the entire night and woke up early in the morning. A couple of my friends had a headache and we started a bit late as we allowed them to take some more rest. 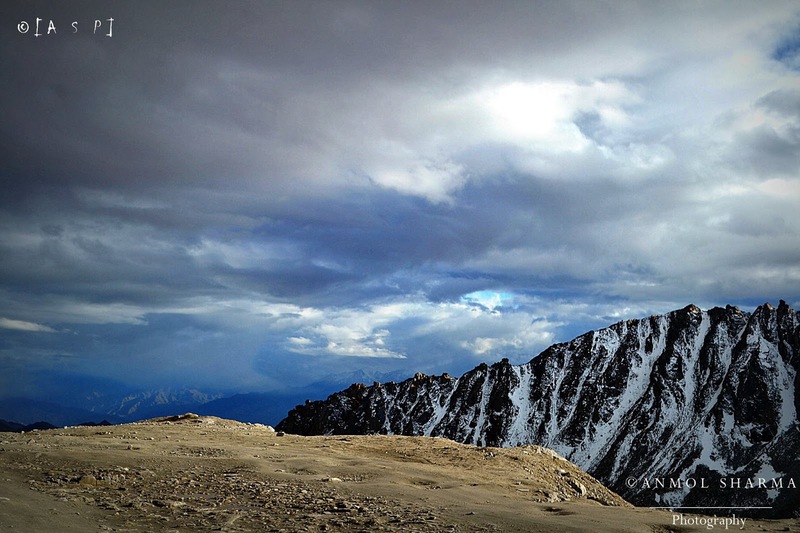 Day 3 - Travel back to Diskit, Hunder and Khardungla Top. We checked out of our homestay around 9 am in the morning. 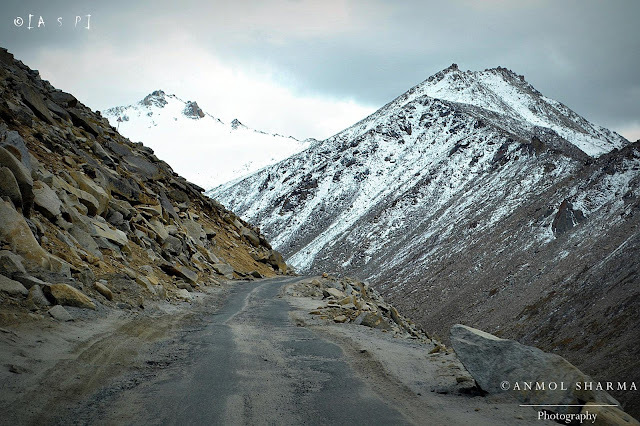 Day 3 was exciting for us as we were to Khardung pass. All these years I wondered how it would one feel to be on the world's highest motorable road amidst the snow and sub-zero temperatures. 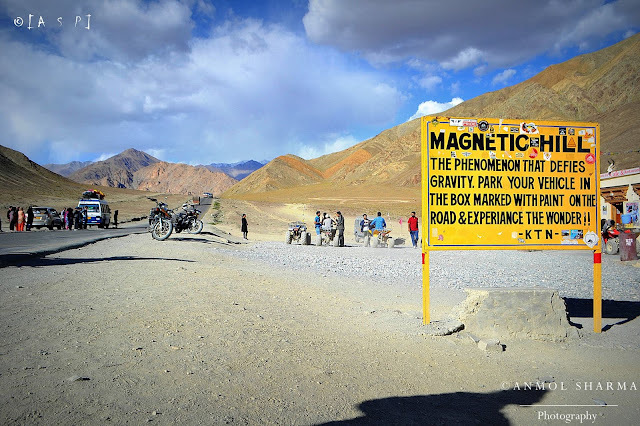 Before heading to Khardungla, we also had a couple of more places that were in our must-see checklist. The first place we went to after checking out was the Samsta-ling Monastery. 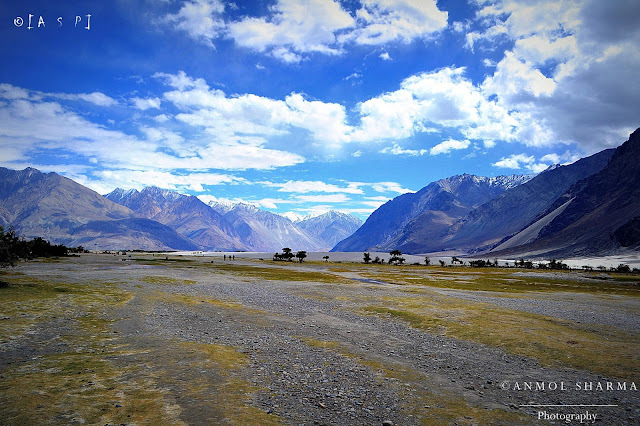 This monastery is said to be about 140 years old and is located in Sumlur village of Nubra valley. It was well maintained, surrounded by beautiful mountains offering pleasant scenic beauty all around. We stayed there for about an hour, clicked pictures and started for Diskit. The journey from Samsta ling monastery to diskit monastery lasted about 90 minutes. Diskit Monastery also known as Diskit Gompa is said to be the oldest monastery of the valley with around 100 monks. The monastery is located on a hill amidst the mountains along with a 32-meter tall statue of Buddha on top of the monastery. The statue, also known as Maitri-Buddha faces the shyok river and the experience of being around the statue on top of the monastery with mighty hills around makes one feels so relaxed. After Diskit, we started for Hunder village for the famous double hump camel ride. The place where camel safari is conducted is picturesque. The vast landscape ceases to amaze each moment you spend there. The Double Humped Bactrian Camels are unique animals with two humps on their backs instead of just one hump. 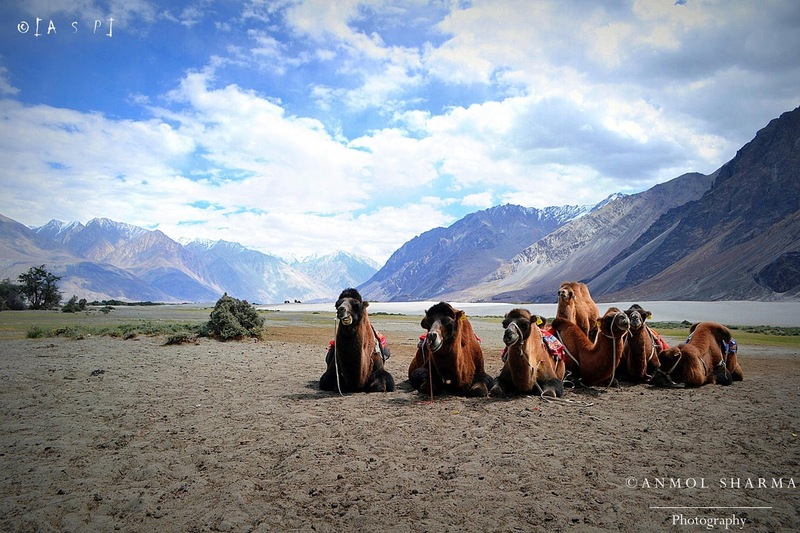 These camels can survive in very extreme conditions and are found only in few locations in the world. A 15-minute camel ride cost around 200 Rupees per person. They have set two milestones for the ride. A longer ride is also available for an increased charge. They click your photos for free if you carry a DSLR else charge 50 rupees per photo. After the camel safari and lunch, we started for the most important milestone for the day - Khardungla top. It is nearly a 100 kilometers of a tough journey with not so good roads en route to world's highest motorable road. As we were approaching khardungla it was already late afternoon and we encountered heavy snowfall as we approached khardungla top. Now, this was a really memorable experience for me as I have not experienced snowfall until that day. It was a heavenly event for me with the snowflakes falling around. 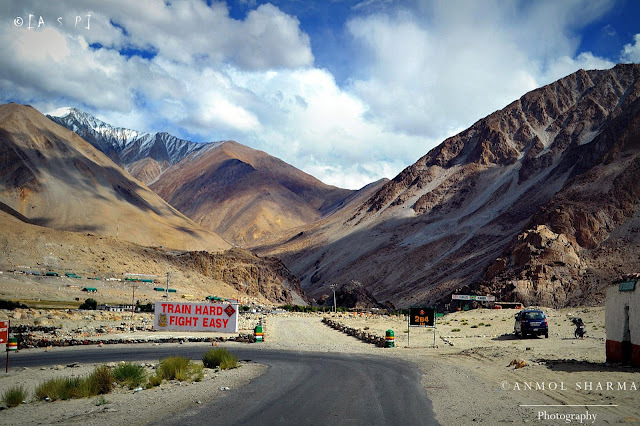 For every biker, car enthusiast, Khardungla expedition is must to experience. 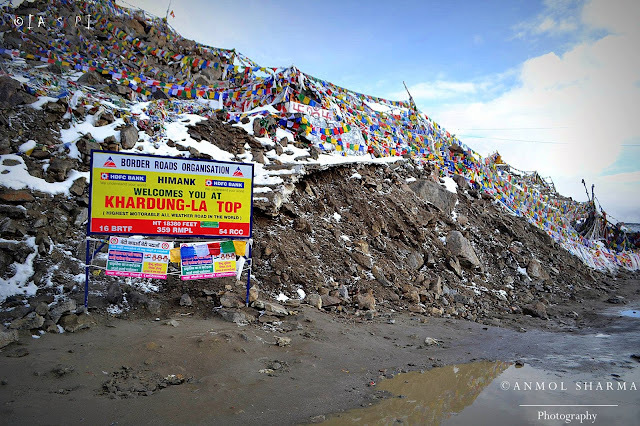 I have also seen people talking about Khardung La as not the highest motorable road. Some reports claim that the milestone with 18,379 ft is not correct. Now I am not sure about that but it was surely the most memorable place in Ladakh for me. It was freezing chill in Khardung La with snowfall in evening. The temperature was -3 degree Celsius. You can not stay outside for a long time in such conditions. After about 20 minutes of gazing around the khardungla, we headed to the nearby tea shop for snacks break. The temple in khardungla had loudspeaker playing Hanuman Chalisa in the evening. It was such a divine experience of a lifetime. We started from Khardungla to Leh city late evening and about in two hours, we checked in our hotel in Leh city. As we woke up on day 4, we realized that half of our trip has been materialized successfully and we are only left with the other half to complete. 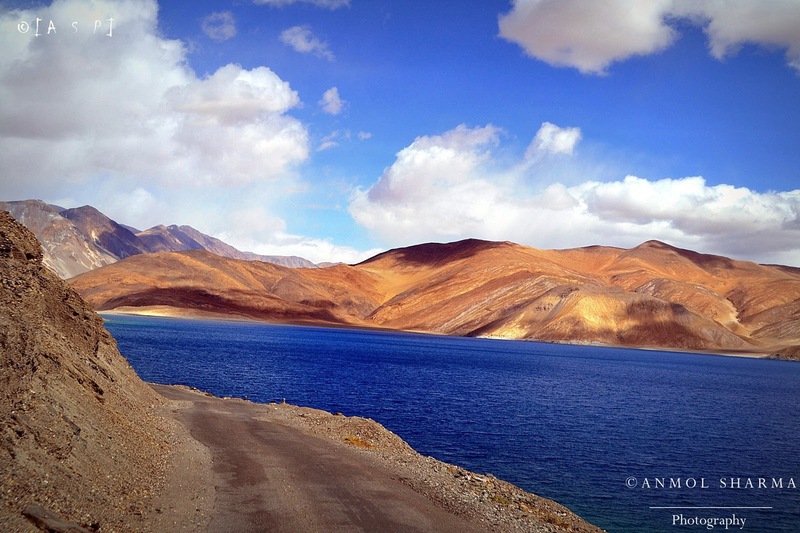 Pangong Lake is around 225 kilometers away from Leh city. We started from Leh around 9 am after having breakfast. The plan for the day was to reach Pangong Lake via Chang La top. 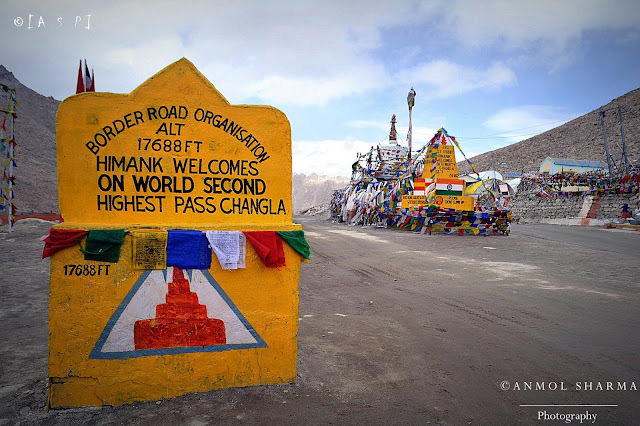 The Chang La top is said to be the second highest motorable road after Khardung la top. En route Changla top, there are a couple of monasteries that are worth visiting including Shey, Hemis, and Thiksey. In the interest of time, we skipped these monasteries for the time being as we wanted to reach Pangong Tso on time and enjoy the evening there including the sunset. Drive to the changla top is a 3-hour journey. The roads are in decent condition but with the steep climb at places. As we approached Changla top, we again experienced snowfall albeit in moderation. The elevation of changla pass is 17,590 ft as compared to 18,379 ft of khardung la top. The conditions at Changla top is kind of similar to khardungla top. One can hardly stay out for 20-25 minutes at max as the extreme cold weather can make things challenging at times. 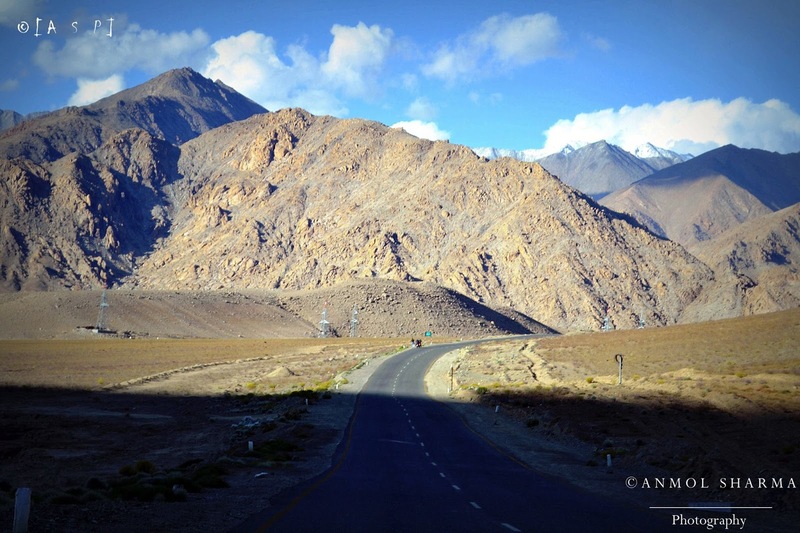 The changla pass is also said to be a pass which leads to the south. There is an army camp situated at Changla top. A temple called Changla Baba mandir is also situated on the pass. The feeling of being on such passes can't be explained easily. A part of you wants to stay there forever but with heavy resistance, one carries on the journey and move ahead. 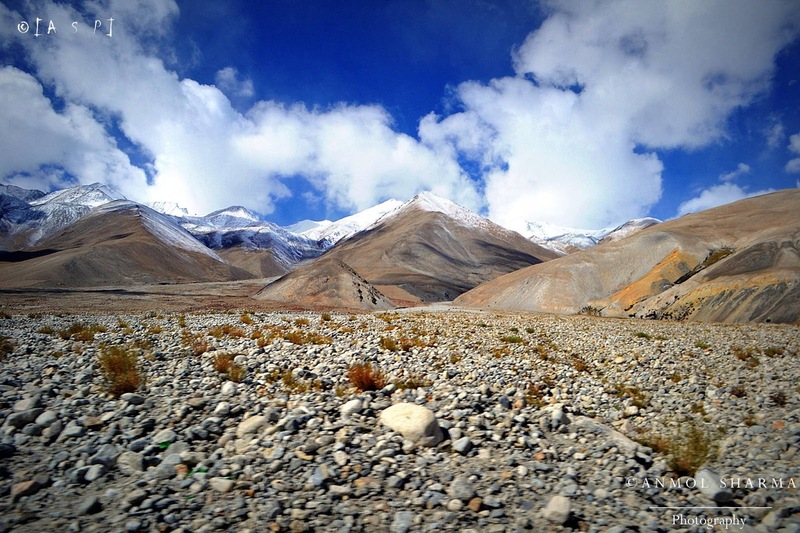 The journey from Changla to Pangong Tso is approximately 5 hours and 150 kilometers long. We started from changla and halted at durbuk for lunch. 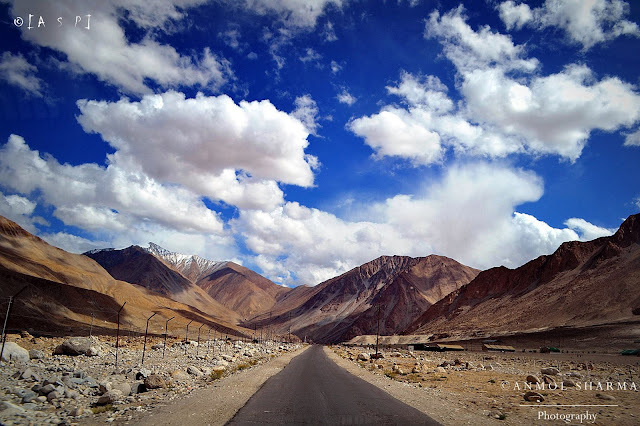 Out of the complete trip, the most picturesque path was the route to Pangong Tso. Often, you will question yourself that how a place can be this beautiful. The lovely white clouds with a pure blue sky in the background with lovely mountains adding to the contrast makes this place a delight for photographers. The first glimpse of Pangong lake was really special for us. The view of sparkling lake far off from mountains as we were descending down on those roads was making us filling us with excitement. 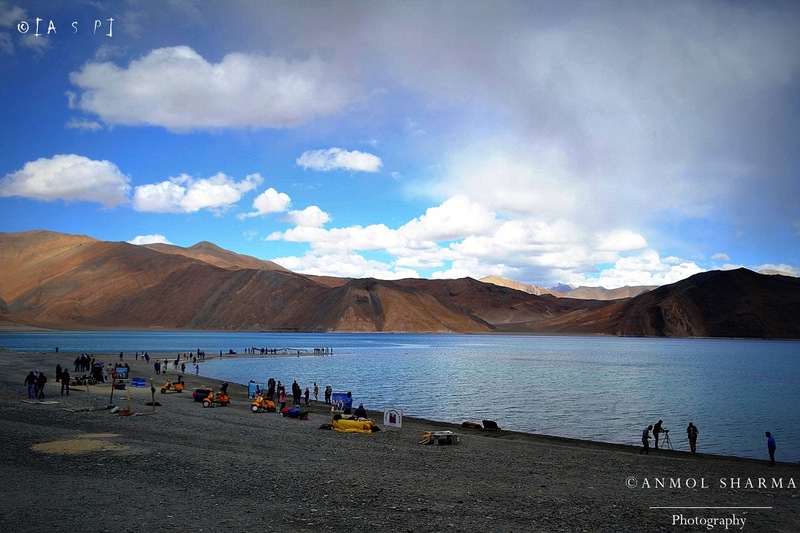 Though I had read about Pangong lake in travelogues, it caught my attention when I saw the movie 3 idiots years back. The place looked exceptionally beautiful and I thought it was a foreign location. The Pangong lake gained for sure popularity because of that movie ending scene. When we reached Pangong lake, we were amazed by the beautiful landscape. The blue colored lake with lovely mountains in the background adding to the contrast is treating to watch. You can stay there for hours and hours and your eyes will still not feel satisfied. Since we reached there in evening, the temperature was freezing cold along with strong winds blowing at that time. It was really chilly. Despite the extreme weather we spend couple hours roaming around the lake and enjoyed its multiple colors that change from blue to light green to grey as you walk around the lake. Lots of bikers had parked their bikes near the lake and for a biker, that moment must be like experiencing total nirvana. The experience is something which must not be explainable in words for them. The lake is 12 km long with part of it with Tibet. After spending time at the lake, we had Hot Maggi, thubka soup, fried rice and tea from nearby food joint. After that, we were all set for camping in the late evening. 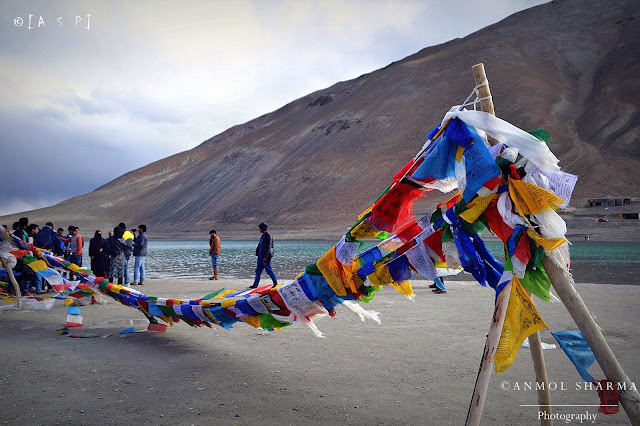 I never experienced camping and it was an amazing first experience for me in Pangong lake. We checked in to Nomad camp nearby the lake, the natural setting, walking distance from the lake, made this camp a perfect destination for us to unwind & relax. The tents get electricity from generators and there is hardly a bulb in the tent and attached washroom. These tents as such don't have any locking facility so it is advisable to not to keep anything valuable with you and better stay in groups. The experience of staying the camp was thrilling. The strong cold winds were blowing and the intensity was so high that we were shivering inside the tents. We were awake for almost all night and could sleep only around 4 am in the morning and move ahead for the final day in Ladakh! The final day of our trip in Ladakh started at 9 am in the morning. 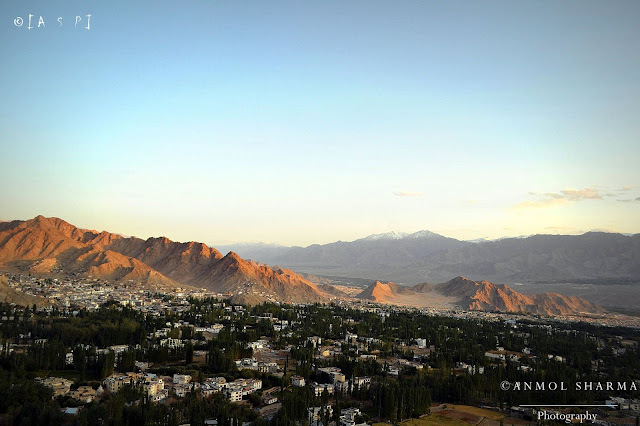 After checking out of our camps, we headed back to the Leh city and planned to cover the places in and around the city. The feeling of departing from Pangong lake was making us feel sad for a moment. We didn't realize how fast the time passed and we were about to finish our trip with last day in hand. We wanted to make best out of the available time. So after the breakfast, we started off for Leh. We could reach only by afternoon and the first place we reached was Thicksey Monastery. 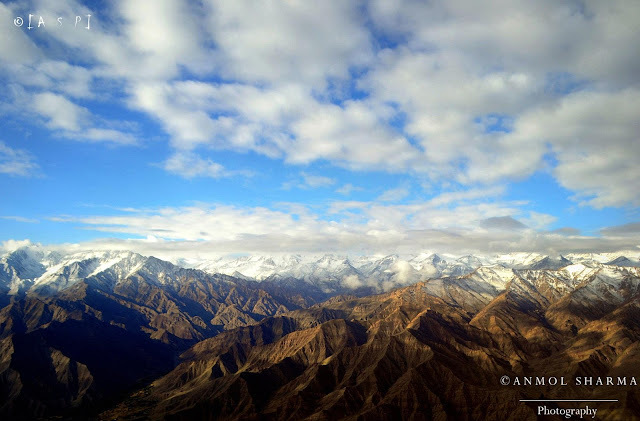 The monastery is located on top of the hill of 3,600 m altitude in Thiksey village which is about 20 km away from Leh city located on the Leh-Manali highway. This monastery has been the location to shoot few ad films in the past. It has many prayer halls along with the statue of Maitri buddha which takes around two floors of the monastery. Next, we reached the Rancho school. The real name of the school is Druk Padma Karpo School. The fame of the school is associated with the 3 idiots movie because of which it became famous and turned into a tourist attraction point. A movie scene was shot there and to commemorate that, a sovereign shop and a cafe have been set up in the school which is open for visitors. A batch of visitors is taken inside the campus for a short tour. The Hall of Fame, located near the Leh Airfield, is a museum constructed as well as maintained by the Indian Army in the memory of the soldiers who had lost their lives during the Indo-Pak wars. It is also termed as a memorial for the war heroes. This building consists of two floors. While on the ground floor, there is information about the brave soldiers as and a souvenir shop but on the first floor, there are artifacts of various wars (mainly Kargil war) such as the weapons used during the war and some important documents, related to the same. There is another section dedicated to the Siachen glacier. The museum shows the history of Leh Ladakh with details of the rulers in Ladakh and how it evolved into a tourist location. 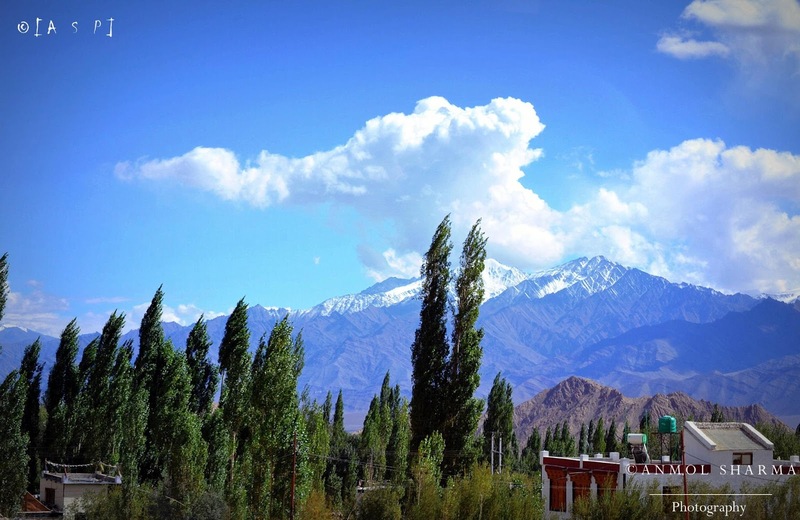 Overall, it is nicely maintained and must to visit place in Leh city. By the time we came out of the hall of fame museum, the sun was about to set. So we decided to skip visiting Royal City Palace in Leh city considering the limited time we had with us. The final sightseeing of the day was the Shanti Stupa. This Stupa was built in the early 90s and it is one of the finest places to spend time in leh city. It is situated at a location which provides panoramic views of the surrounding landscape and watching the sunset with city engulfing in darkness was an amazing experience. The architecture of this Stupa is quite modern and it is lit beautifully in the evening. We could also see royal city palace from Shanti Stupa along with a birds-eye view of the city. The city palace was built by the king of Ladakh in the 16th century. We had to skip visiting royal city palace as it was already late evening and we wanted to check-in to our hotel & take some rest. After some relaxation, we walked towards the local market of Leh city and bought few t-shirts, key chains, magnetic stickers, a couple of jackets and some souvenirs. We settled down in the evening and cleared the dues/rent for the vehicles that were taken on rent. Around 10 pm, the Leh market closes and just before that we took our dinner and walked back to our hotel as next day we were traveling back to Delhi. All of us really enjoyed this trip, in the hotel that night we played bluff almost all night, had amazing conversations, discussed life and had the best times of our lives. I hardly slept for an hour or so and it was already morning 6 am. It was time to get ready and head towards the airport. After breakfast, we checked out of the hotel and reached the airport in time. All set to leave for Delhi, it was an emotional moment for us to leave Ladakh behind us. 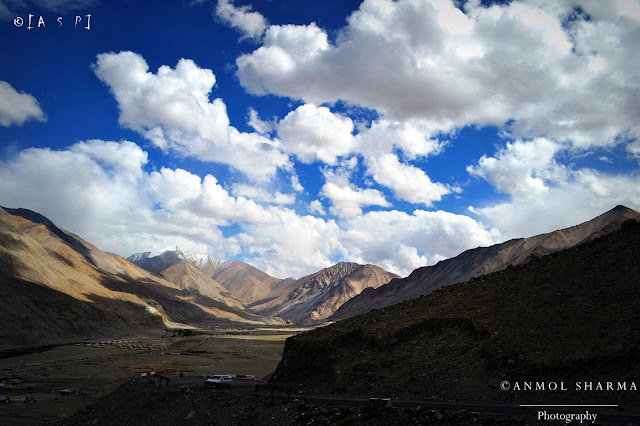 With those lovely memories in our mind and heart, we happily bid goodbye to Ladakh. The flight took off on time and within 2 hours we landed in Delhi. The temperature on arrival was over 36 degrees while compared to the weather in Leh where the mercury was hovering around 2-3 degrees. I could not realize how fast the 6 days trip got finished. I wanted to go back, once again to experience everything one more time. This trip has very positive experience in my life. For many days after coming back from Leh, I was completely relaxed, there was not an inch of stress around, rather it was not affecting me in any way. That's the beauty of mountains - they purify your soul and that's why they keep calling you back. 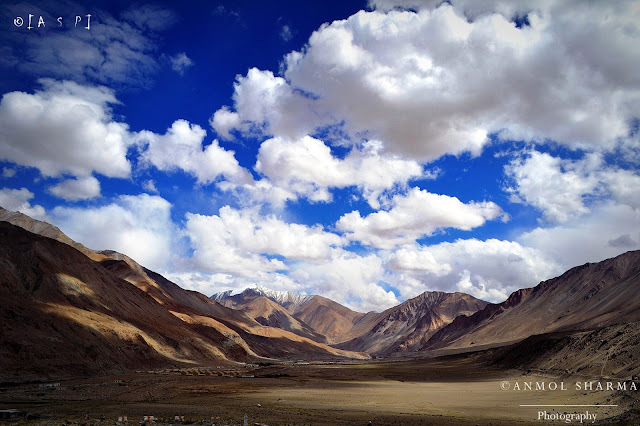 You go to Ladakh and came back as a better person - that is one thing for sure that I experienced on a personal note. Thanks for reading and I hope many people will fulfill their dream of visiting Leh Ladakh this year.